You are here: Home / BLOG / Uncategorized / Trapped! The composting worm bin lives in the upstairs bathroom adjacent to my office/studio room. So when things get weird in the bin, I know about it. I think that I picked up earwig eggs when I added compost from the outdoor compost bin – I always do this to help stock up the micro-flora. However it happened, I started getting more and more earwigs. The pincers look fierce, but aren’t actually pinchy from what I can tell. They stink a lot if squashed. There are lots of them. They thrive on the same kind of vegetable waste that I feed the worms, and they’ve reproduced like mad. Of course, my options for insect remediation in the compost worm bin are quite limited. Traps are usually the best. I looked up how to trap these guys, and most of the sources pointed to a similar technique. A straight-sided can, like soup or tuna, with a mixture of equal parts of molasses (or corn syrup), vegetable oil (with the possibility of a drop of added bacon grease, for fragrance attraction) and soy sauce. Because of what I got hold of in the cabinet first, I’ve tried a couple of different oils. It’s amazingly effective. 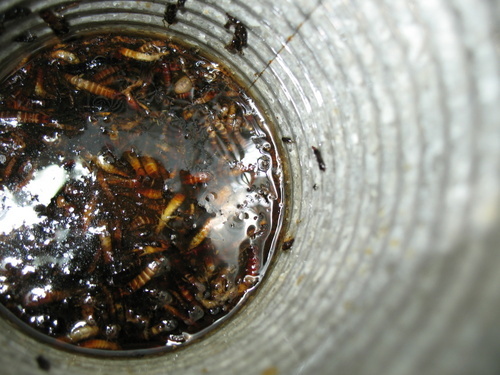 This is five or six days worth of earwigs. They mostly end up in the trap overnight, as they are nocturnal. I let it go a few days, then tip the oil out in a non-agricultural part of the yard (the chickens declare the bugs delicious!) and refill and reset. Apparently it works in the garden or house as well. 0 0 Michael Michael2012-08-16 19:42:422012-08-16 19:42:42Trapped! Does the mixture prevent them from being able to climb out? I don’t know what part of it does what particular thing, but they drown in the liquid. I’ve seen some sources that only list the oil, so maybe the other parts aren’t entirely essential. Of course the chickens love them! Those bugs have been marinaded and seasoned! Good that you can deal with the problem without recourse to any dubious compounds. And no waste, because the chickens recycle the biomass! Do you have any wild-silk caterpillars growing? I’m a pest professional and I normally bait them with old newspapers or toilet paper rolls. They eat and nest in cellulose. I normally recommend to my customers that are having problems to put an old paper out near where they are having a problem before I come out to spray. I’ll have to try this method out. I bet my chickens will love a can of earwigs! I\’ll have to try this method out. I bet my chickens will love a can of earwigs!